Required raw materials: gold, silver, copper, rhodium, earth, amber, glass, ichor (earth elemental), blood (bird), blood (hornet), blood (own). Being a bit late with these. I was working on last week's one and hoping to get it out on time, but it looks like it's gonna require a little bit more time. 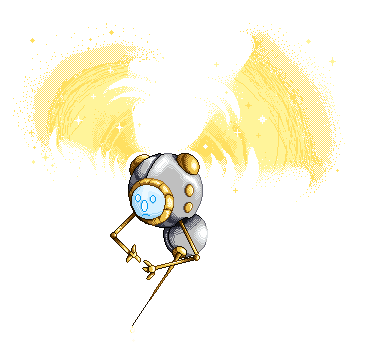 Clockwork Menders are cat-sized vaguely insectoid machines that exist to repair other constucts. 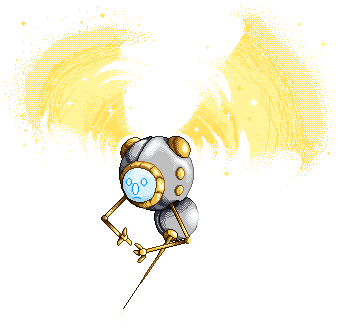 They can be individuals, but are commonly found in swarms, though the swarm doesn't last very long as Clockwork Menders will use up their own life force in the repair of another construct. Their main form of defence is a numbing poison. With the Improved Familiar feat, some ranks in Craft (blacksmithing) and an open-minded GM, you too can have one of these little creatures as a companion. That or you can try to steal one from the plane of Mechanus. Trying out pixel-stuff a little bit, because its fun in a way. I'm not sure if I could do this consistently, but it's still fun. I was actually originally trying to do this with pen and ink, but found that I'm still to inexperienced with it to have the steady hand required for perfect circles. The Knell Beetle is yet another creature you can add to the list of the products of bored wizards. Because sometimes you have to merge a bug with a bell. 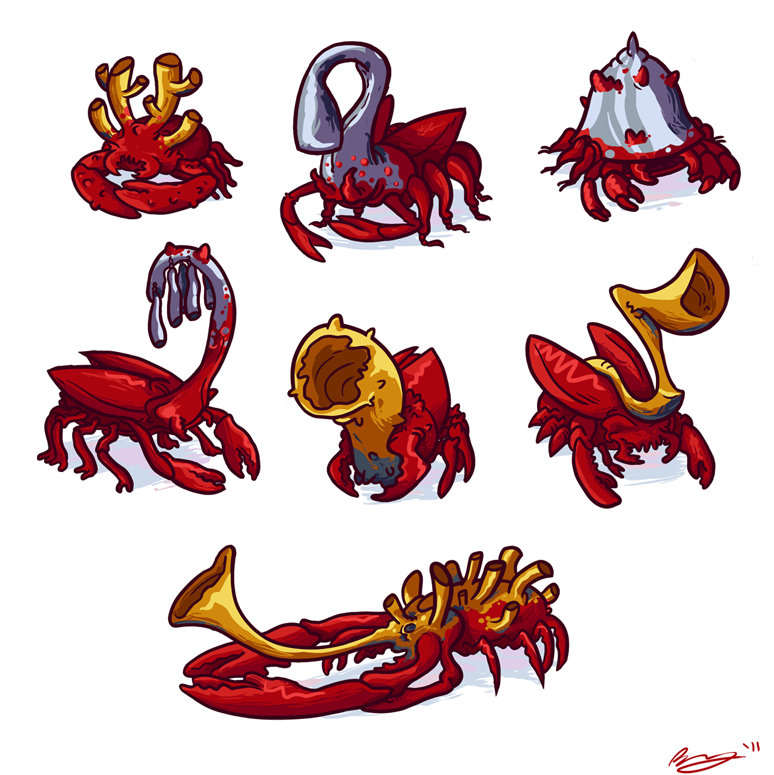 Only the description in the Monster Manual is a creature with ten legs, claws and a red carapace. That's a crab, dawg, not a beetle. I couldn't decide on what shape to give them, as you can see, because I quickly found out that it's silly. Because knell beetles are tooting lobsters. Oh and these things are CR 10, as big as cars and move in colonies. So if you feel like finding one to laugh at, you should probably wait a few levels. The Satyr bounds along the path playing his pipes. You begin to feel drowsy. Make a Will save. 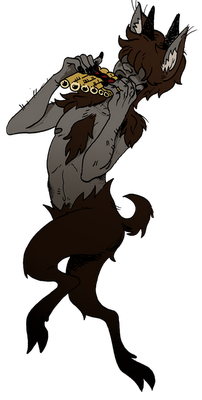 The Satyr is a classic monster from Greco-Roman mythology. The Monster Manual actually had two challenge ratings for it, one with its pipes and one without. A Satyr who carries pipes around with him can play them to create three different tunes with different effects: charm person, fear or sleep. The pipes themselves are not magic; it's more like the Satyr happens to know how to play these spells. I don't know if a CR 2 Satyr becomes a CR 4 encounter if he finds some pipes lying around, or if the CR 4 Satyr just knows the tunes, whether he has pipes or not. Also experimenting with traditional inking. I found a collection of nibs back home over the holidays and am playing around with them, mostly because I got Bone as a Christmas present and think the inking in it is amaaazing. After four long days traversing a wilderness seemingly inhabited only by a smattering of parched trees, you begin to wonder if you will ever see civilisation again. Your hopes suddenly rise as you begin to percieve human sounds far off in the distance - sounds of revelry, it seems - and you quicken your step towards them. A camp? A village? Could it even be a town? As your curiosity deepens, you observe a group of men and women moving over the hill towards you clothed in rags and leaves, dancing, whooping, and playing instruments. But something seems off. The howls too gutteral, the dancing frenzied and animalian, the music strange and dischordant. And then you see their eyes, bloodshot and crazed, and you realise something is very wrong. As some instinct tells you to flee, to stay from their path, to block every sense against the hypnotic debauchery, the revellers are already upon you. The music swamps you as you steadily feel your mind become one with the endless festival, the great hunt of Dionysus, the dance of the Bacchae. Happy New Year, everyone! Blanca's away without a functioning computer at the moment so I've been re-drafted in to help with the festivities. We talked over a bunch of NYE-themed monsters and the ones I liked most were the Bacchae, those paragonal partygoers who should serve an example (goal?!) to us all in their ability to keep a-rockin' through the early hours of the morning. I myself had a lovely dinner in London's chinatown with a friend and saw in 2012 being kettled in by police on Waterloo Bridge! but it wasn't so bad. Hope you all have a pleasant subsequent twelve months!